TCNJ Art & Art History is pleased to present Ink/Paper/Press, a collection of Printmaking works of over 25 students ranging from Fine Arts, Graphic Design, and Art Education majors. This showcase represents the development of printmaking through innovative non-toxic techniques and a diverse range of processes including drypoint, monotype, etching, relief, and post-digital. These works represent a collective experience of working through the visual and technical process of making proofs, editions, and varied print media works on paper. The developing Printmaking area at TCNJ aims to bridge hand drawn, graphic, and photographic image-making to allow students a broad range of self-expression. As a new faculty art member, Marchelo Vera is working on updating the curriculum and print facilities at the College. 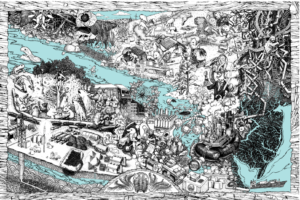 Contributing artists: Zoe Adams, Rachel Bendik, Jake Irons, Brandon Jones, Archana Kamani, Alana Lant, Lauren Leocata, Linda Magee, Carolyn Mandracchia, Madison Oskowiak, Zachary Paige, Robin Reigle, Anthony Vanacore, Emily Warakomski, Christa Wisniewski, Alyssa Angel, Carrie-Anne Carpenito, Chrystianna Carrino, James Cavalieri, Paulina Costello, Keith Glidewell, Stephanie Makrancy, Diane Noone, Mariya Rivera, Ashley Schnyer, Alana Sueskind. This exhibition has been extended until April 15, so please come out and continue to show your support! Jake Irons is a Junior Art Education major. His work often includes elements of painting, sculpture, and performance to create hybrid pieces. Irons brings to life the abstract concepts of human perception, memory, experience, and emotion. Largely introspective in nature, Irons’s work attempts to weave together an understanding of ourselves as individuals and how our own experiences shape our identity. Alana Lant is a Junior Art Education major and the president of Rebel Art Movement. In blending reclaimed objects from previous decades with unnatural and modernized elements like levitation and astral glow, Lant’s work explores the synergy between times. Lant’s work also contains obsessive references to pop culture that captures Lant’s true inner feelings in bursts of powerful images. After working closely with the sixth to eighth graders at Rivera Community Middle School in Trenton, NJ during her student teaching experience, Angela Rossi sought to create an opportunity for the students to celebrate their accomplishments in a professional setting. 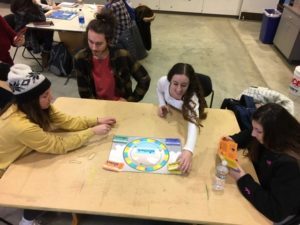 In cooperation with art teacher and TCNJ alumnus Robert Esposito, Jr., Rossi helped demonstrate to students an understanding of various elements of art and principles of design through the exploration of movements, artists, and careers in the field. This exhibition emphasizes the role of art in the students’ education and the positive impact that such self-expression has on their lives. Seven emerging artists will exhibit their thesis projects that explore the concept of domains. ‘Domain’ can be conceived as the home or the internet; the territory by a single ruler of government; a realm or range of personal knowledge or responsibility; fields of thought, action, and influence. 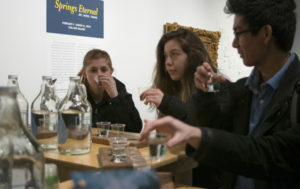 The works of Deanna Arzola, Brigid Barber, Danielle Deering, Jonathan Dix, Kelly King, Owen Lynskey, and Molly Revie are four years in the making, culminating in the Senior Fine Arts & Lens Based BFA Exhibition. The works on display will include weavings, concrete and glass sculptures, videos, installations, paintings, and more. What is censorship and how do we contextualize it? Is censorship necessary in order to maintain societal standards? Is it restrictive to the creative process? Should we conform to what is ‘appropriate’? Or should we dare to be different? Twelve graphic designers explored these questions and more, navigating the choices of communication and self-expression in their art and designs. Rob Birnbohm, Danielle Davis, Natalie La Spisa, Lauren Marsiglia, Jaclyn Newberry, Zach Paige, Eric Phillips, Jason Proleika, Jazmine Ramirez, Mike Scilla, Sophia Spiridakis, and Jess Tirone share their experiences qualitatively through their work, with each portfolio offering a unique window into the designer’s development, style, and personality. Seven emerging artists will exhibit their thesis projects that explore the concept of synapses. A synapse is the point where impulses are passed on in the brain and is a vital area of connection. The works of Aubrie De Angelis, Melina Magriples, Tandia McLaren, Yesenia Rosado, Angela Rossi, Jenna Shargay, and Adrienne Southrey are four years in the making, culminating in the Senior Fine Arts & Lens Based BFA Exhibition. The works on display will include paintings, photographs, installations, and more. The artists present an awareness of how one’s mental space interprets things of value.